Employment in the state of California is generally considered to be "at will," meaning the employee can quit or be fired with or without cause at any time during the course of their employment. In certain situations however, employers will require an employee to enter into an employment contract detailing what the job requires, the compensation that the employee will receive, and other specific elements that differ from case to case. If you have signed or been asked to sign one of these agreements, you could be unintentionally signing away some of your rights as an employee. Chris Olsen is an experienced employment contracts lawyer in San Diego with the ability to stand up and fight for victims of unfair practices. If you have signed or been asked to sign an employment contract, or have fallen victim to a breach of contract, contact our office to schedule a free consultation to find out what options are available to you. 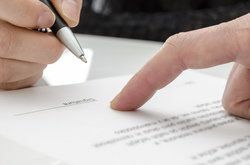 All too often, prospective employees will enter into an employment contract with their new employers without even realizing what they have signed. Attorney Chris Olsen can negotiate on your behalf to ensure that your needs are met without conceding your basic rights as an employee. This is a delicate process because you are beginning a new job and do not want to start off in an adversarial role, but it is imperative to secure your interests before signing a binding agreement. Our attorney will make carefully crafted arguments to achieve your goals without putting you in bad standing with your new employer. If you have entered into an employee contract and feel that your employer is not upholding their side of the agreement, you should first try to pursue action through the proper channels with your employer. If you are unable to come to a resolution through internal methods, our attorney can protect your rights and earn you the compensation you deserve. Chris Olsen has represented clients in a wide range cases related to employment contracts. He can help you understand what your legal rights are and what options are available to you. If you feel that you may be the victim of an unfair termination under an employment contract or have been asked to enter into an agreement with a prospective employer, schedule a complimentary consultation with attorney Chris Olsen today. He can help you understand your rights as an employee and fight to ensure that you are treated fairly and with respect.